The next time you find yourself fleeing an oppressive regime across the galaxy, or to just another country, you won’t have to worry about whether or not you’ll be able to plug your lightsaber into some unfamiliar socket. This immobile version of R2-D2 from Brando hides an entire stack of power adapters for 40 different countries. If you’re heading back to Tatooine again, you’re out of luck, but this set of three adapters should work just fine here on Earth. 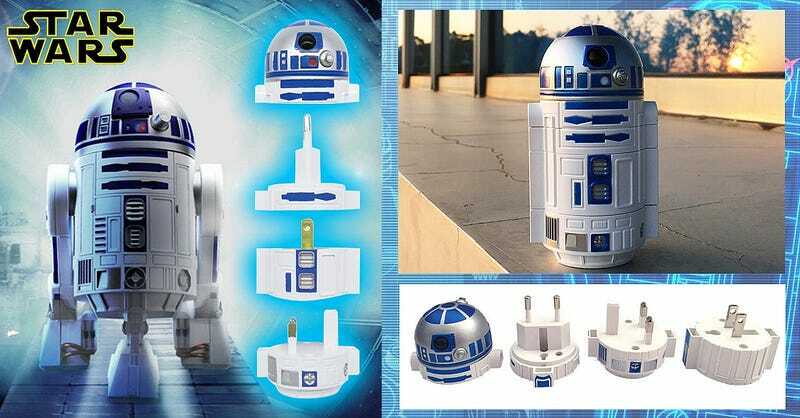 For $42, it’s not the cheapest or most compact set of adapters you can travel with—does Artoo’s dome head actually do anything?—but if you’re still lining up to see Star Wars movies there’s probably not much we can say to dissuade you from buying this.